Izvestiya reports that Defense Minister Sergey Shoygu is organizing some “superlight” army brigades. It’s an interesting turn given that his widely discredited predecessor Anatoliy Serdyukov also looked at forming light motorized rifle brigades based on wheeled vehicles. Perhaps the latter’s mistake was that the vehicles weren’t necessarily Russian-made. Shoygu’s “superlight” brigades will use the UAZ Patriot — either the SUV or Pickup variant. The SUV is referred to as a jeep at times. An earlier model — the Hunter — actually resembles a jeep. The intent, reportedly based on Syrian combat experience, is for these “superlight” motorized rifle brigades to slip around or through heavier enemy forces to conduct raids at distances of several hundred kilometers. According to Izvestiya, the UAZ Patriot or Pickup is supposed to carry up to seven soldiers (a highly dubious proposition), their weapons and gear, as well as additional fuel, supplies, and ammo. It will be armed with either a 30-mm AGS-30 automatic grenade launcher or Kornet or Konkurs ATGMs, as well as a 12.7-mm Kord machine gun. The brigade’s mortar batteries are supposed to have 82-mm 2B14 Podnos mortars mounted on the UAZ vehicles. An MOD official familiar with the developments told Izvestiya the formation of the “superlight” brigades has begun, and they will appear “soon” in the Southern and Central MDs. They will have less personnel and equipment than traditional MRBs, but will be more mobile and maneuverable. The “superlight” brigades will also have one battalion in BTR-82s as well as artillery and MRL battalions. Izvestiya notes that, in 2009, Serdyukov put the 56th Independent Air-Assault Brigade in the UAZ Hunter, but the experiment was quickly abandoned. The MOD official says they were needed and worked well in the Volgograd steppe, but it was difficult to fit personnel and equipment in the Hunter. Soldiers, he said, sat cheek to cheek in very cramped conditions. That brigade returned to its venerable GAZ-66 trucks. The same problem is likely with the UAZ Patriot and Pickup. They look like four-seaters. This sounds like a sweet little deal for UAZ. It is part of the larger Sollers automobile manufacturing group, itself owned by Russian steel conglomerate Severstal. 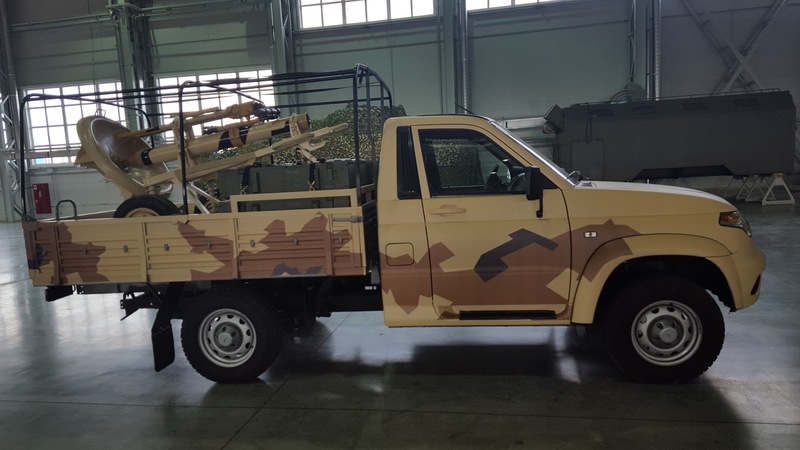 It’s odd there’s no photo of an UAZ Patriot or Pickup military prototype when the first “superlight” brigades are reportedly almost ready to appear. And there is also potential competition. The Military-Industrial Company (VPK) has its Tigr light armored vehicle with a 30-mm gun or Kornet or Konkurs ATGM launchers mounted. The Tigr, however, is a larger, heavier, and much more expensive vehicle. GAZ might make something comparable to the Patriot or Pickup. GAZ already makes the BTR-82. Like VPK, GAZ is owned ultimately by Oleg Deripaska. This entry was posted in Force Structure, Ground Troops, Shoygu's Reforms and tagged AGS-30, ATGM, Jeep, Konkurs, Kord, Kornet, Patriot, Pickup, SUV, Tigr, UAZ. Bookmark the permalink. Mortar tracking version, but the question of the number of soldiers carried is not solved yet. maybe a version with benches on both side of the rear platform, with soldiers face to face and some gear, can fit 4-5, plus the 2 up front, we might reach 7, but as said it’s only “up to” 7. Eastern MD 14th Spetsnaz bde in Khabarovsk receives large number UAZ-3163 “Pikap” vehicles, can mount Kord, AGS-17 http://bit.ly/2u1bzgM. Will MOD have same trouble with UAZ Patriot SUV? Burned up going off road. Fire reportedly caused by trans fluid. http://bit.ly/2wes4nl. VDV’s 45th Spetsnaz Brigade has gotten about 20 UAZ Patriot pickups. http://bit.ly/2y44v5l . 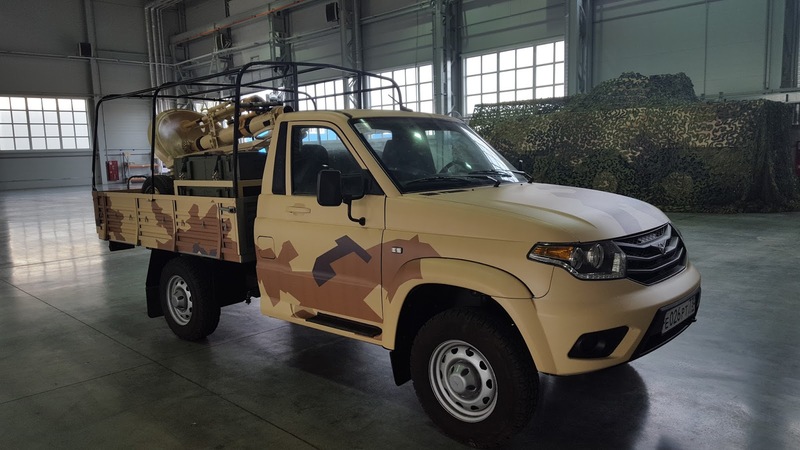 VDV’s 7th DShD in Novorossiysk reportedly has received 30 UAZ Patriot pickups. http://bit.ly/2huYvg5.